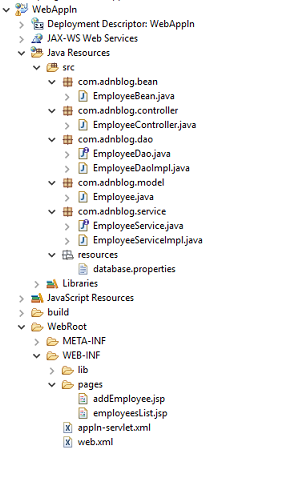 In this post, We can write a simple Spring MVC web application i.e CRUD operation using annotation based Hibernate ORM. The CRUD operation means Add, Edit, Select and Delete. 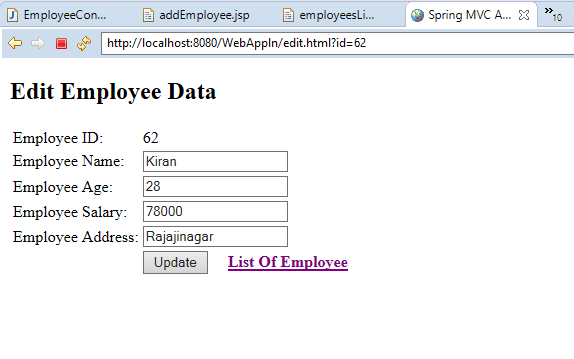 We can create web application using Spring and Hibernate as follows. The project structure i.e folder structure shown in the below image. In the above configuration, most important is to give the correct spring bean configuration location otherwise it won't take configuration file. In this example, appln-servlet.xml is the bean configuration file kept inside WEB-INF folder. The entity bean Employee maps with database employee table. So I'm creating an employee table is as follows. 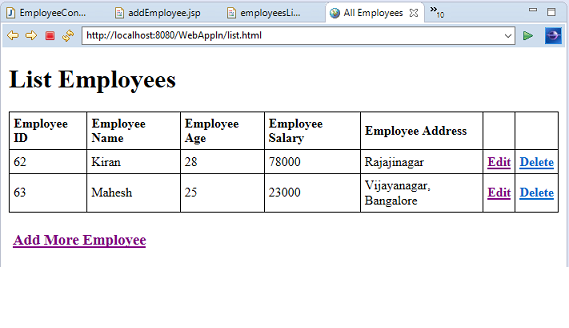 employee table - Using PostgreSQL database. create one properties file under resource folder i.e database.properties, there keep all database information as a key value pairs, and this information you can access in the bean configuration file. using PostgreSQL as database, you can use any database and configure here properly. We will create the EmployeeDao interface to declare the methods that are used in the CRUD example. Next we can implement those methods in another class. We are using Spring transaction so Hibernate transaction not required. In Service also I created one interface, there I declared all CRUD methods. Next in implemented class implemented all methods and used Spring transaction. The Controller class is a heart of MVC pattern, using @Controller annoation Front controller finds the appropriate controller using HandlerMapping. It will take the request, process it and send model data to the appropriate view. Next create one xml file under WEB-INF folder, give same file name whatever in the web.xml. This configuration file config the bean and view using some tags. The appln-servlet.xml file is as follows. I have created two JSP here, addEmployee.jsp and employeeList.jsp. 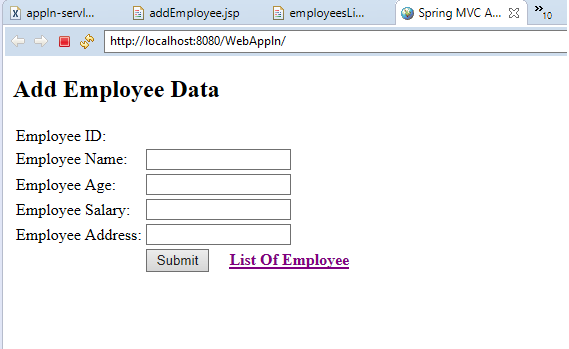 The addEmployee.jsp is using for adding and editing the employee details, employeeList.jsp is for displaying the employee list and delete the particular employee from the list. If you run the given application without spcifying the URL, it will execute the welcome file i.e add.html so by default add employee will call. Spring is one of the most popular and widely used Java EE frameworks. Through dependency injection it can provide tight coupling between various components. The cross-cutting tasks such as authentication and logging can be provided through Spring framework and the aspect-oriented programming can be implemented through this as well.